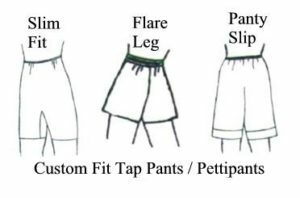 Non-binding comfortable tap pants, pettipants, knickers, bloomers are sometimes very hard to find. Even when you think you have the right size according to your hip measurement, the elastic around the legs can bind, pinch and cause chafing. 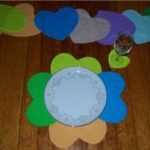 This can all be eliminated when you use our custom tap pants patterns that have been made according to actual misses and plus size women’s measurements. 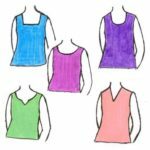 The downloadable PDF pattern comes with full-size pattern pieces in your choice of two size ranges S-XL and 1X-5X. Sizes S-XL: pattern contains 4 sizes – Sm (32-34″), Med (36-38″), Large (40-42″) and XLarge (44-45″). 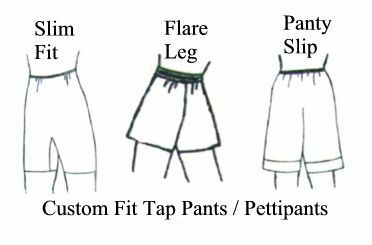 The custom fit tap pants / kickers / bloomers pattern is designed for tricot and cotton knits which are normally 60 to 80 inches wide. 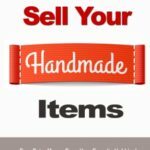 Step by step illustrated instructions on how to choose fabric to how to sew the garment, including several different hem variations, everything is here for you. You’ll find these tap pants, knickers and bloomers so comfortable you’ll be making them out of every color tricot you can find.